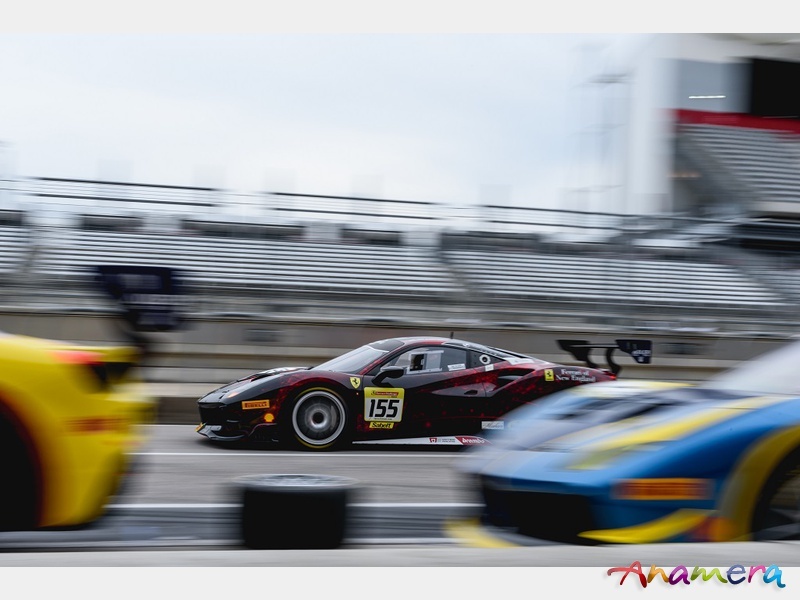 The 2019 Ferrari Challenge Trofeo Pirelli season kicked off at the home of Formula One in the United States, the Circuit of the Americas. What began as a gloomy day with threat of thunder and lightning, turned glorious and warm at the mid-day mark. It became the best possible context for the opening round of a Ferrari Challenge weekend. Trofeo Pirelli. Cooper MacNeil (Scuderia Corsa, Ferrari of Westlake) stormed off from pole to an immense lead that he maintained successfully for most of the race. His concentration, however, slipped at the very worst moment, as he entered the final corner on the final lap. What seemed to be a small moment of instability entering the corner became a massive moment of rotation as his 488 Challenge car pirouetted on the apex of turn 20. Benjamin Hites (The Collection), running a lonely race in 2nd seized the moment, attacked and eked out a victory by just two tenths of a second. Further down the order, Martin Burrowes (Ferrari of Ft. Lauderdale), recently transitioned from his 458 EVO and championship 2018 season, came out top trumps in a three way dice between long time competitor James Weiland (Ferrari of San Francisco) and another 2018 champion, Thomas Tippl (Scuderia Corsa, Ferrari of Beverly Hills). Trofeo Pirelli AM. Mark Fuller (Scuderia Corsa, Ferrari of Silicon Valley) took the win, the Pirelli award and the Gentleman’s Cup, a clean sweep. Mark was a bit ahead of his nearest challenger, Barry Zekelman (Ferrari of Ontario), generating a five second gap by race-end, while Ziad Ghandour (Boardwalk Ferrari) took third position, pressuring Barry to the end, though ultimately falling short by just over one second. Coppa Shell. A crowded circuit made life a bit more interesting for those in the Coppa Shell category. Sharing the circuit with the Coppa Shell AM drivers, COTA was filled with 30 488 Challenge cars for their opening race of 2019. In the Coppa Shell category, Danny Baker (Ferrari of Palm Beach) romped to victory after an excellent start. The former 458 EVO driver, clearly found a comfortable groove, surviving various amounts of pressure through the 30 minute race. Mark Issa (Ferrari of Atlanta), claimed an emotional 2nd place finish after earning pole in the morning’s qualifying session. Dale Katechis (Miller Motorcars) claimed a tense third, just ahead of Kevan Millstein (Ferrari of San Diego). The two were well acquainted from many shared battles in 2018 when they were both in the Coppa Shell AM category. Coppa Shell AM. Brian Davis (Ferrari of Palm Beach) claimed his first ever win in Ferrari Challenge competition, holding off Ian Campbell (Ferrari of New England) in the thirty minute sprint. The race to the finish saw multiple mixed class battles as an early spin for Geoff Palermo in the Coppa Shell category meant that he had to claw his way back to the front through several Coppa Shell AM competitors. Nevertheless, Brian’s result was quite impressive as he finished in fifth overall, and well among many of the Coppa Shell competitors. The duo was joined on the podium by Kris Perzan (Ferrari of Ft Lauderdale) who claimed third position. Trofeo Pirelli. Cooper MacNeil avenged his last lap mistake of Saturday and took an absolutely dominant win in Race 2 at Circuit of the Americas. The Ferrari of Westlake driver bolted on the start and never looked back, averaging nearly 1mph more than his nearest competitor, equivalent to a 17 second gap as they crossed the line. Benjamin Hites (The Collection) had a thrilling race, but for different reasons as was shuffled back at the start and spent the rest of the race chipping away. A number of thrilling passes later, none more so than multi-lap battle with Martin Burrowes (Ferrari of Ft. Lauderdale), and Benjamin was back in second position, but no where near close enough to chase down Cooper. Martin came home in third, seven seconds ahead of last year’s Coppa Shell champion, Thomas Tippl (Ferrari of Beverly Hills). Trofeo Pirelli AM. Ziad Ghandour (Boardwalk Ferrari) repeated on the podium, but this time earned the top step over Todd Morici (Wide World Ferrari) and Dave Musial (Ferrari Lake Forest). Ziad’s performance was similarly demonstrative to Cooper’s in the Trofeo Pirelli class, where Ziad generated a 19 second gap by race end. Further back it was a bit closer, with Todd only one second ahead of Dave as they crossed the line. Saturday’s race winner, Mark Fuller (Ferrari of Silicon Valley) unfortunately did not start the race.